Try to kill all the enemies and control your character. Use the mouse to shoot and use bombs if you need it. Avoid any obstacles and do everything to become the real hero. Collect coins and stay alive! Is everything clear? Then move forward and become the real winner of the game. Are you a real warrior? Then this game is for you! 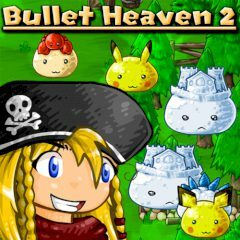 Here you will dodge thousands of bullets and blast hundreds of foes, in this exciting bullet hell adventure! Be ready to ride on your flying magical sword as you shoot down incoming enemies fast approaching. Well, do you have the awesome skills to dodge thousands of bullets and blast hundreds of foes, in this exciting bullet hell adventure? Then just play this cool game and try to stay alive as long as possible. Do not forget to collect all the coins and you will set the best record here. Are you ready for that? Then go ahead!